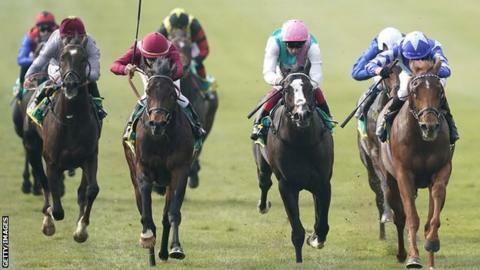 Skardu won the Craven Stakes at Newmarket as the well-touted Godolphin duo of Royal Marine and Zakouski finished down the field. The 3-1 winner, ridden by James Doyle for William Haggas, won by a neck from 28-1 shot Momkin, with Set Piece (14-1) third. "He knuckled down really well - all the right signs are there," said Doyle. Skardu, a son of Shamardal, was cut to as low as 6-1, behind favourite Too Darn Hot, for the 2,000 Guineas. Too Darn Hot, the mount of Frankie Dettori for trainer John Gosden, has been favourite throughout the winter for the the first Classic of the season on 4 May. But his odds have drifted to around 5-2 after Gosden said a decision on the horse's participation will not be confirmed until the weekend following a minor setback. Earlier, 66-1 outsider Keystroke was a surprise winner in the Abernant Stakes for trainer Stuart Williams. The 10-11 favourite UAE Jewel, who has an entry in the Dante Stakes at York - a leading trial for the Derby at Epsom in June - was an impressive winner of the Wood Ditton Stakes. It was another good victory for trainer Roger Varian, who saddled Qabala to win the Nell Gwyn Stakes on Tuesday and that filly is now 6-1 favourite for the 1,000 Guineas.